Hey remember that time, when you were at that place, and you saw that really cool sticker? And that other time when you were with those people and they had some cool stickers. Who doesn’t love custom stickers? If you see a sticker anywhere, or create a sticker then simply whip out that phone, tablet, camera, or whatever device you’re plugged in to. 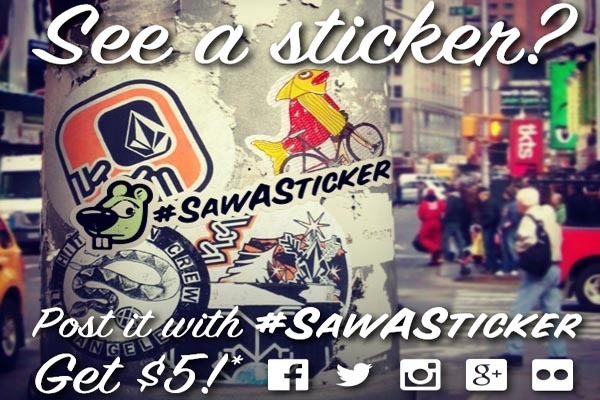 Then upload the image to Instagram, Facebook, Twitter, or Flickr and hashtag the image with #sawasticker. You can also manually upload through our website (no longer available). Your sticker pic will automatically be displayed in the #SAWASTICKER Gallery for all to see and enjoy. For simply adding your image to the gallery, we will be sending you a $5 OFF promocode for use on StickerYou.com. One of the StickerYou Crew will be in touch to make sure you get a personalized code. This is how we keep spreading the sticker love. If you would be so kind as to also share the sticker love, you can share your own sticker pic and any other sticker pictures on your Facebook by clicking the share button.